lives in Buenos Aires Ana Poliak studied drawing, painting, set design and photography, but also graduated in film direction and theory. She mainly focuses on film and related media. Since 1989 she has her own production company, Viada Producciones. The source of this double installation Sin Titlo is her feature film La Fe del Volcán, of which she keeps only two sequences, as a gesture of enforced purism: on one monitor she shows the prologue, on the other one the end of the film. The actual story is completely left out in order for the spectator to use his own imagination to fill in the gap. This gives the spectator a lot of freedom, but at the same time also an assignment. In the prologue Ana Poliak shows herself with all her vulnerability and doubts. She stares through a window while in her mind she tries to cope with a personal crisis. We can hear her inner monologue, her heartbreak, that doesn’t stand on its own but is connected to the pain of a whole country, her motherland Argentina, that is going through an economical and social crisis. 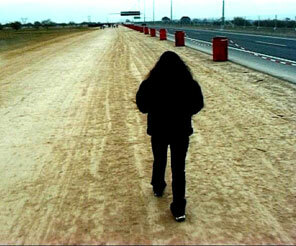 On the second monitor the camera follows a woman walking by a highway over a waste land. The camera is so close it seems to weigh on her. The harsh colours, the desolate landscape and the drone of the traffic intensify the image. On top of that the text of Nietzsche resounds. In fact, the installation forms a circle. A vicious circle? Like life itself?